What a day we had on the Saturday, the rain kept falling, all day it drizzled and then poured alternately. The puddles in the car park got bigger but by the time we had finished setting everything out it had stopped, our only hope was that it did not rain again during the night and that it would stay away during Sunday. Were our prayers answered? Yes they were, we woke up early Sunday morning to find the sun shining and it continued to shine all day – how lucky was that? 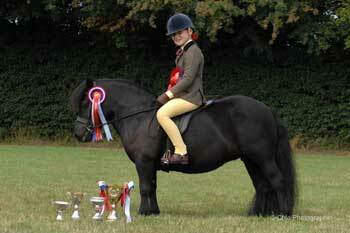 We were at a new venue, the Kingfisher equestrian centre, Nr Castle Cary, right in the heart of the Wessex area. It is a beautiful, very bright and light new arena offering enough room for two rings and a collecting area. Many of the exhibitors expressed their approval and thanks for another new venue central to the Wessex area. Exhibitors came and came and continued to come from near and far until the car park was breaking at the seams, which gave the two judges, Mr I Bailey and Mrs C Collinssplatt an amazing amount of ponies in each class to judge so were kept extremely busy. 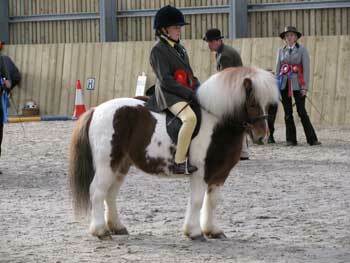 There were over 180 entries culminating in some of the biggest classes of standard ponies we have seen for a long time, especially the mare class. 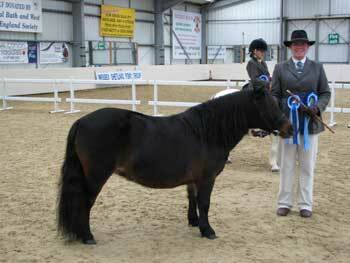 After a long day, they eventually found their Supreme Champion from the standard mare class – Bincombe Peggy and Reserve from the ridden class – Stallcombe Barnacle. The Group held its early summer show at the Gillingham & Shaftesbury Town & Country Fayre on Sunday 13th June 2010 where exhibitors were able to relax in the sunshine and enjoy a pint of real ale and some great local produce from the Food Hall & Farmers Market, whilst singing along with the Mangledwurzels and Smac, if they still had the energy after competing! The show attracted 150 entries which kept the judges, Mr & Mrs Jones from Angelsey in North Wales very busy. Exhibitors for the 28 classes came from far and wide, Devon, Berkshire, Winchester, Hampshire, Windsor and of course many more local ponies and their owners. 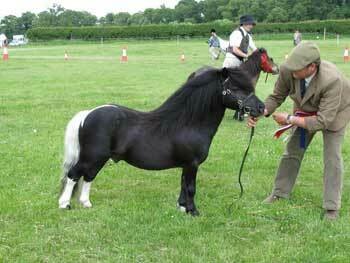 It was lovely to see so many ponies at the show which made class sizes very good in both the Standard and the Miniature pony rings. The Junior Standard Championship was won by Mrs Beryl Rae from Devon with a home bred three year old colt Samber Scholar and the Senior Standard Championship was won by Mr Walters Schivas Kerry a black standard mare. 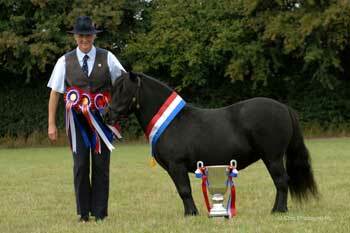 In the Miniature ring the judge chose Mrs G Mather's (from Berkshire) home bred three year old colt Shawdene Aerial to be her Junior Miniature Champion with the Senior Miniature Championship being won by Mr Hodges young stallion Halstock Velvet Fox. The ring Champions Schivas Kerry and Halstock Velvet Fox, who were also Supreme Champion and Reserve respectively were presented with embroidered fleece rugs which were kindly sponsored by The Equine Clothing Company who are trade stand supporters of the Country Fayre. In the main ring during the lunch break, to the delight of the spectators a Shetland pony parade took place, it was fantastic to see ponies of all heights, ages and colours ranging from a miniature foal to a standard stallion parading for the crowd to enjoy, the finale being a long line of ponies standing across the ring whilst the audience were given an informative commentary on the Shetland pony. 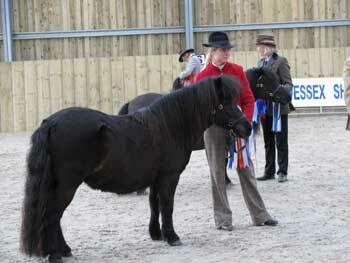 All of the ponies were well behaved and represented the breed beautifully. We were lucky with the weather again this year and the racecourse at Wincanton offered itself to be a lovely venue yet again. 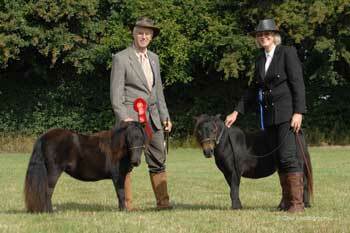 With plenty of exhibits we kept the judges, Mr & Mrs Wright, busy with big classes throughout the day. It was lovely to see new members at the show with their ponies and well done to all of the young handlers, these classes became very competitive throughout the year. After barely having time for a break, Mr & Mrs Wright found their Supreme Champion in the three year old black standard filly Champlers Mimosa delighting her owners Mr & Mrs G Smith, and the Reserve Supreme went to Snelsmore Matilda, a chestnut and white yearling filly bred and shown by Mr & Mrs C Percy. 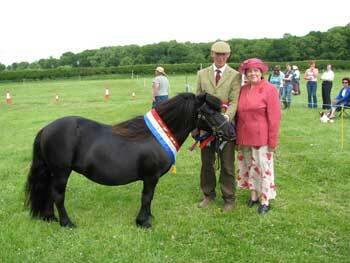 A lot of the classes at this show and at our other show’s during the year were sponsored with special rosettes which were absolutely beautiful and some nearly as big as the ponies head! All of these were generously sponsored by group members and all greatly appreciated by the winners. November saw us holding the last of our shows in the beautiful arena at Kingston Maurward College in Dorchester, with judges Mr D Hodge and Mr J Walters. Just because it was the last show of the season for us did not mean that exhibitors were tired and wanting a rest, they all seemed to have got their ‘second wind’, there were large classes with exhibitors coming from near and far and some extremely well behaved foals out for their first trips. 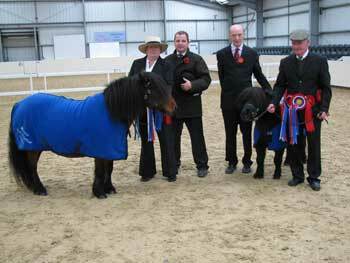 After casting their eyes over many ponies throughout the day, Mr Hodge and Mr Walters chose the black miniature stallion Kerswell Commando as their Supreme Champion and the standard mare Somahouse Mist as the Reserve, both owned by Jill and Roger Jones – a good day for them.